Remember your loved one when they pass with a living memorial donation in lieu of flowers. Your loving donation will continue to provide support for rescues to live in peace and safety at The Sanctuary. This makes your donation a living memorial on behalf of your deceased loved one. Flowers last a day, your $50 donation provides remembrance of your loved one and can be can be continued annually if you desire. Donations In Lieu of Flowers, Donations In Honor Of, & Dog Memoriams: Your gift is a meaningful way to pay respect to someone you lost, a person you would like to honor, or a pet who crossed the rainbow bridge. Each tribute gift helps Noah's Ark achieve our mission of saving hundreds of animal lives each year. With each donation, Noah's Ark will notify your special loved one of your thoughtfulness by email or a thank you card. Please contact Pam Sanidakos for more information. 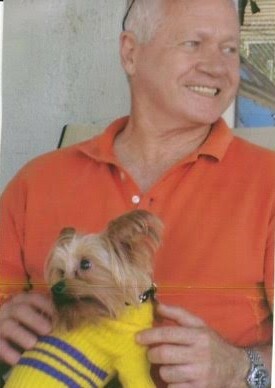 Uncle Chuck loved animals and was a supporter of a rescue center in the New Orleans area. His family members John and Tammie Thomassee adopted Jolie (Liz) and Carlton, pictured below. Daddy was saved and we had talked about how this earthly life would pass away but the soul would never die. He stated several times, "I hope I just die in my sleep, but I probably won't be that lucky." Well, Daddy, God blessed you and all of us who love you, by giving you the easiest transformation possible! Thank you, Jesus, for that earthly blessing and also thank you for letting us experience a 'sweet sorrow'. Daddy had adopted Dutchess (pictured with him in slide show) from N.A.B.S. as a senior dog about 6 years ago. She always waited for him and hunted for him when he was in the hospital or gone on trips. But when he passed, I brought Dutchess in to say goodbye to her master. She understood and although she grieved for him, she didn't ever search for him. Somehow she just KNEW. The last 3 1/2 years of his life, Daddy lived next door to us. Dutchess lived with us after he was gone until her own peaceful death 2 years later. She was a joy to everyone. When I petted her I was comforted by memories of his feeble hands touching the same fur I was touching. She was his angel in fur. Thank you, N.A.B.S. for providing Dutchess to Daddy for him to enjoy in his senior years. She followed him every step he made." Daddy and I listened to this song together shortly before his death. We played it at his funeral. 5 generations represented here, 3 of which have already passed. 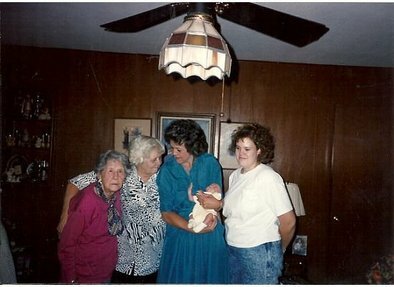 This memorial is for the second from left, Tessa Miller's grandmother, Memaw Jeanne Cook . Tessa is the baby in the picture. Donation to N.A.B.S. in lieu of flowers by Pam Cundiff who says to Tessa, "She was a wonderful, loving person and I know you are going to miss her terribly. She was crazy over you."